Scott numbers have been given for these listings. If you would prefer to examine the stamps before purchasing, or you are any seeking stamps (or any condition or any quality) not listed here, please send your want list using your choice of Scott or Facit numbers. Unless there is a 6-digit item number in the left-most column, the images shown in this section are standard images of the issues from my image library; they are presented to show the designs of the stamp issues and not to show the specific individual stamps being offered. 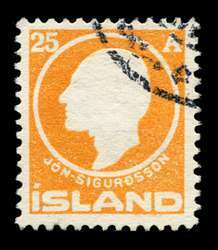 The centering of the stamps in the images is usually Superb or VF quality; again these are not images of the individual stamps being offered. 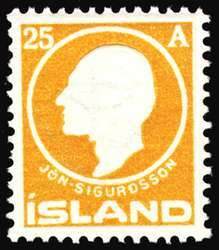 Most early stamps had multiple printings, thus color shades vary greatly; the colors in the images are random printings/colors. If there is a 6-digit item number in the left-most column, the image is of the actual item being offered. All the listed conditions and qualities were in stock at the moment this list was prepared and I endeavor to maintain them in stock and to keep this website updated. 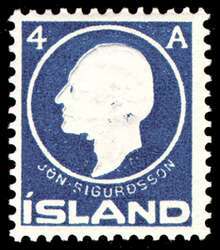 However, my stock changes daily and (to paraphrase) good stamps are hard to find. If you are willing to accept a different grade or quality if an item is temporarily out of stock, please let me know when ordering (add a comment at the conclusion of the shopping cart process) and please also let me know of any alternates you will consider. Furthermore, new stamps are being put in stock every day; if the quality and/or condition you are seeking is not listed, please send your want list. The publication of this list is a "first effort" in quite a long time. It surely includes a few errors; I will be grateful if you would inform me of any errors. 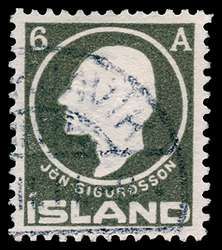 Stamps "missing" from the list simply might not be included because they are not in stock or are singles which are normally only listed in full sets. Just the same if it seems like something obvious (and not a single from a set) is missing, please let me know. If you can offer for sale items that are not listed here, please do so; I especially need sources of pre-1940 mint (hinged or never hinged) stamps and recent used complete sets. Prices are subject to typographical error and change, but I will do my best to honor the listed prices to the extent of available stock. Specialized Stamps many pages starting here (Varieties, Blocks, Cancellations, and other interesting items). 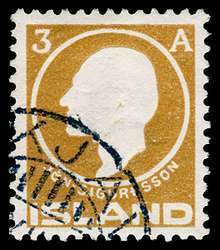 "Gallery" offering scarcer stamps such as Skllings, Prir overprints, and scarce I Gildi overprints. 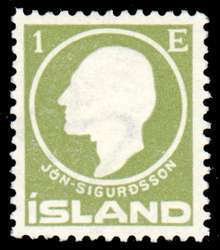 Several "Bargains" pages offering inexpensive examples of stamps, usually with hidden defects. 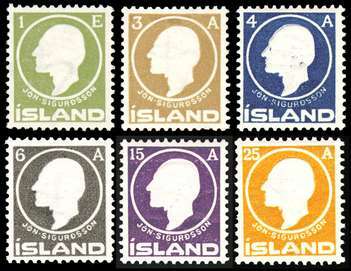 Stamps with Tollur (customs revenue) cancellations. TIP: These price list pages are in Scott number order. To most easily navigate these stamp price list pages, use the "drop down" menu located above this text (and at the bottom of every page). You can also hover over the numbered page links and read the name of the page in the bottom status bar of your browser. 87 [1911 3 aur Sigurdsson] Mint Superb, lightly hinged. Large, even margins, with great centering and unusually strong color. Very attractive and very seldom offered thus. 87 Used Superb with neat, light cancellation. 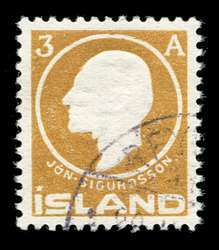 87 [1911 3 aur Sigurdsson] Used Superb very neat, light (but correct) cancellation. Very large margins with perfect centering. Very attractive and very seldom offered thus. 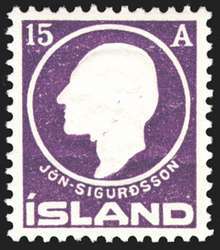 89 [1911 6 aur Sigurdsson] Mint Superb. Large, even margins, with great centering and perforations. Very attractive and very seldom offered thus. 89 Used Superb with neat, light cancellation. 91 [1911 25 aur Sigurdsson] Used VF centered with very neat, light (but correct) cancellation. An unusually attractive example!